By the way, THANK YOU to everyone who found my first “Secondhand Slim Down” announcement post. You’ve encouraged me with your comments and messages, and I’m happy that the post didn’t escape you! I’m not keeping these weight loss journey posts a secret, but I’m not blasting them out to everyone, either. This post may contain affiliate links. Please see my affiliate disclosure here if you have any questions. Back to “My Plan”, though! My weight loss journey is something I want to work on as naturally as possible, through fitness and better eating habits. I’m not interested in medical weight loss, strict diet plans, or supplements (or substances) of any kind. During the first week of this journey, I worked out at the gym 4 times and walked on our home treadmill twice. I didn’t overdo it or jump into the deep end. Rather, I focused on a steady amount of low-impact cardio (treadmill walking, elliptical, and recumbent bike) and weight machines (pin machines). For the weight machines, I alternated days: arms/back and legs/abdominals. 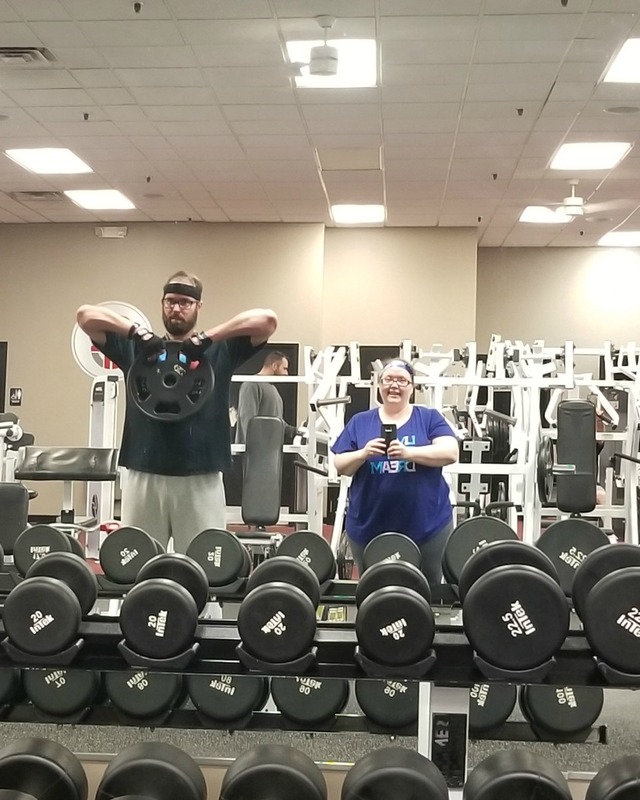 On the weekends, my husband and I work out together – he’s more interested in bulking up, whereas I want to do the opposite! My food plan will focus on good quality protein, vegetables, and a lower intake of carbohydrates. I don’t want to say that I’m committing to a low-carb lifestyle because I assure you that I will, on occasion, eat pizza! 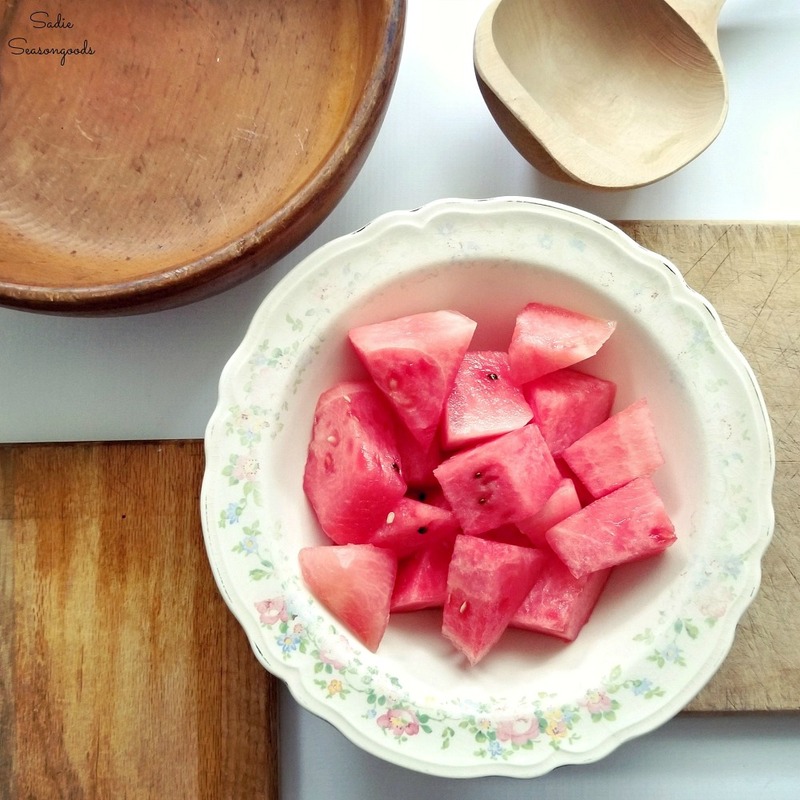 And I refuse to give up fruit – in fact, summer is coming and I’m already looking forward to watermelon season. I have, in the past, referred to cold watermelon from the fridge as “mouth air conditioning” on a hot day. Ultimately, I just need to be more mindful of snacking habits (mindlessly eating from the bag); resist temptation when I’m in the bakery section at the store; and ensure that my meals about fueling my body, not an afterthought of empty or massive calories. I rarely eat fast food, but would do so occasionally when I’m running errands. I simply want to commit to not doing it at all! Now, I just need to focus on consistency so that exercise / gym workouts become a habit. Once upon a time when I was in my mid-20s, I couldn’t imagine a day without exercise. And while I’ll never have that 20-something-year-old body again, I at least want the mindset. And I’m pretty sure that I can have a healthier body that doesn’t tire out so quickly. 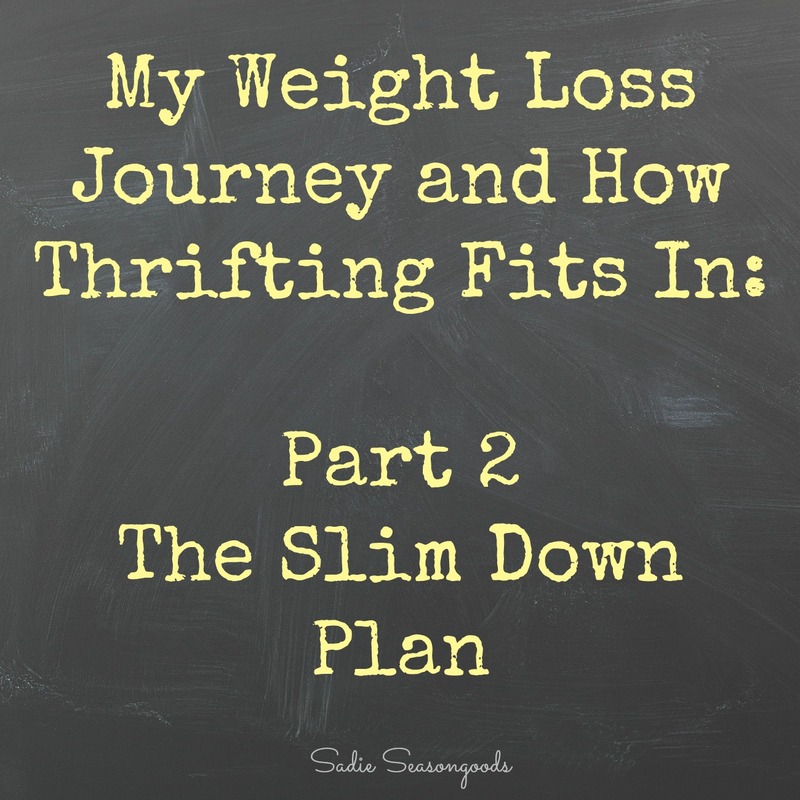 I know that this is a “Secondhand Slim Down” series and I haven’t mentioned thrifting in this post ONCE! 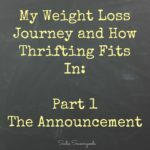 I still plan to incorporate secondhand goods into my weight loss journey, but I’m not there yet. I *did*, however, treat myself to some new workout threads, including these awesome workout headbands. Why do I like them so much? Because they tie around your head, instead of being an infinity loop. 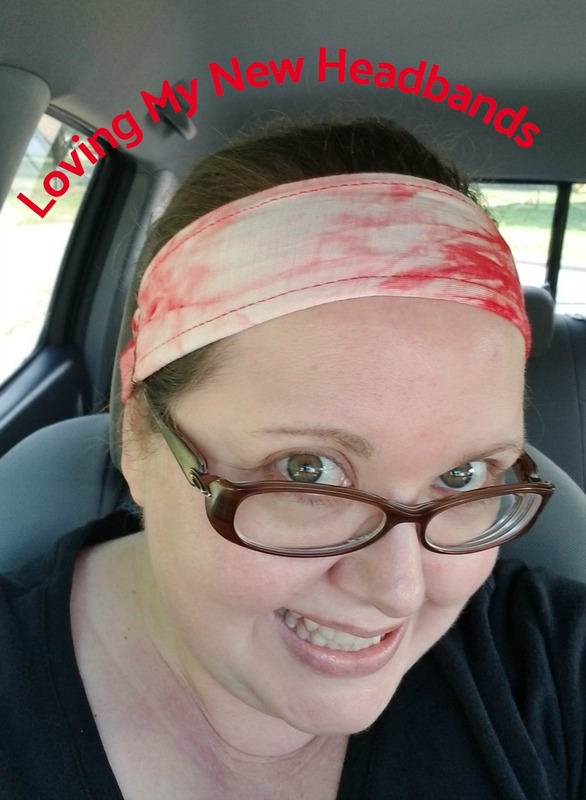 I have a big round head, and regular headbands can get tight and uncomfortable. But a tie-on headband allows me to control the tightness, which is a lifesaver since I’m prone to headaches in general! At the end of the day, there are no secrets or shortcuts to my plan to lose weight naturally. Long before I was a blogger, I was a biologist at my corporate job. And the science is there – moving more and consuming less/better results in natural weight loss. Thank you for reading this new blog series of mine. By doing this, I hope to not only stay accountable and on track, but to bring comfort to anyone else out there who is ashamed of their body or weight-related health. 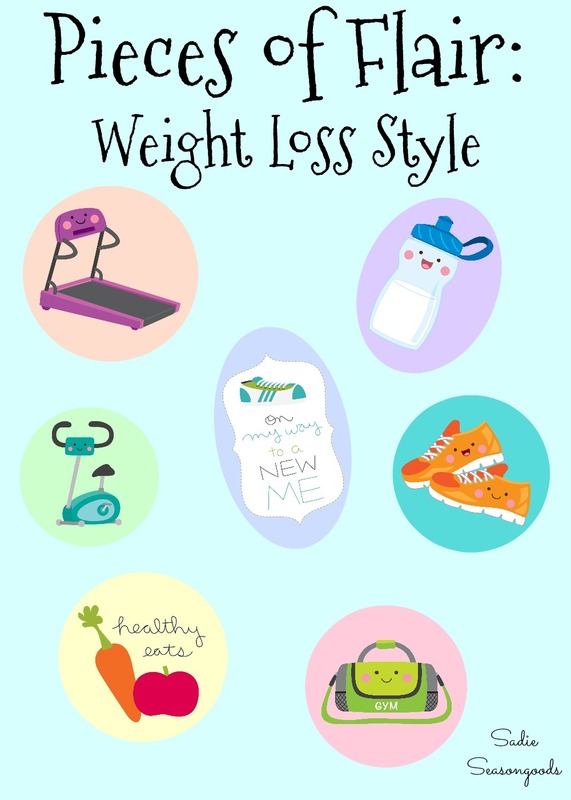 I am not a doctor or medical professional in any capacity, so everything I blog about during my weight loss journey is simply my own opinion and experience. Please consult a medical or health professional before beginning a weight loss program or for medical related questions. To be notified of my next upcycling project tutorial or Junkin’ Journey Blog Post, Please Subscribe! Thank you!! You know, it’s funny – if I publish one of my tutorials, I have no shortage of photos and graphics. But I have to be more creative with the weight loss posts, LOL. Thank goodness I discovered cheap clip art that I can purchase on Etsy! I love the approach you are taking. Moderation and lifestyle change instead of some weird frenzied lose 5 lbs overnight on a deprivation diet and workout 6 hours a day plan. Those plans never have lasting results. You’ve got this, girl. Just persevere and have patience. I wish you all the best!! Thank you so much, Jenni! Even though I had bariatric surgery, I still have to watch what I eat. I have to make sure I get enough protein first and foremost, and I find that difficult to do. One thing I do is have last night’s leftovers for today’s breakfast instead of eating breakfasty things. Keep up the good work! You’re in my thoughts. A sensible plan of lifestyle changes is the best way to a permanent change. Keep up the good work! Good luck on your new weight loss plan Sarah. After being diagnosed with diabetes this past summer, I too have been doing just that slowly and steadily. I did it by mostly cutting out the sugar. Now I have lots of energy and walk all over the place. Above all else, it is our health that we need to be mindful of because the life of a blogger in front of the computer is not the healthiest. Yes!!! I talked about that in my first weight loss post…so much sitting. Sometimes I wish I lived in a city so that I’d be able to walk my errands (or bike, etc.) but that just doesn’t work in a suburban setting usually. So, to the gym I’ll go! Sounds like a great exercise routine…and it’s so nice you and your husband can workout together. Thanks!! It definitely helps with accountability! Good Luck on your new beginning,,,,Faithfully Follower….. Thank you for sharing your strategies! 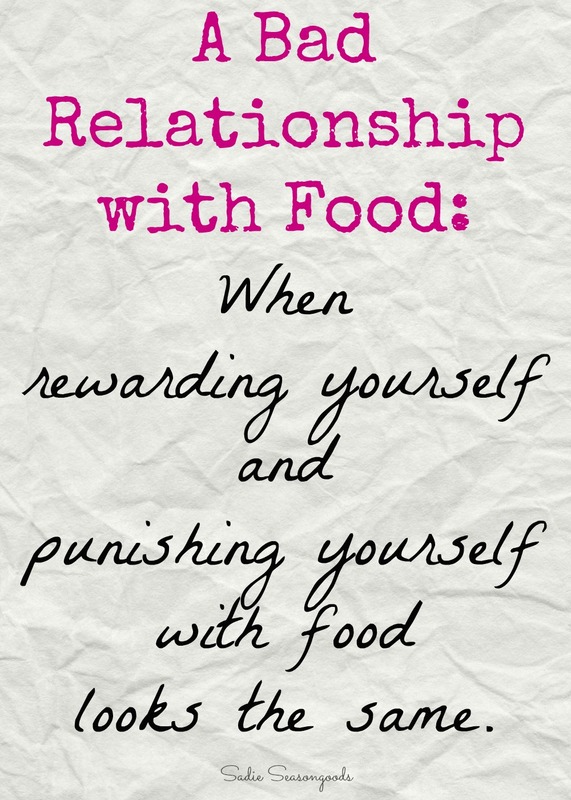 I am also focusing on eliminating the bad, having more of the good, and defeating temptation/mindless eating. I have a job that requires a lot of physical movement, so I skip the gym part (for now). Just cutting out all of the stuff I shouldn’t be eating anyway and eating smaller portions has trimmed 6 pounds off in the last few weeks. Slow and steady wins the race. That’s AWESOME, Gina! I agree, slow and steady is the healthiest and wins the race. It’s all about making the gym a “habit” for me right now, even if I don’t see any results. It’s amazing how much more energy I have now, even after going consistently for just a couple of weeks!